Do you know that high-quality speakers are usually made of wood? It’s has been a standard for all the electronics devices to use the materials like rubbers and synthetics. But, in fact, using wood as the primary material can stimulate the speaker’s output and make it a lot better. That improvement is caused by the wood material which works as the resonance-free enclosures. That’s why Polk Audio RTI12 offers you with the idea of using wood as the main material of this speaker. The speaker’s advantages don’t just end there; it is equipped with another woofer for midrange to be emitted by membranes made of polymer, along with the addition of a subwoofer. It also makes a significant amplification of the sound possible. All that features are for the purpose of supporting the sound quality. In other words,we can expect the Polk Audio RTI12 to emit powerful sound and the best sound stage quality. Without further talk, let’s proceed to the detailed explanation. Polk Audio is equipped with dual 5,25-inch polymer composite cone drivers and three 7-inch polymer composite subwoofers surrounded by rubber. To ensure it has a bright and good soundwave quality, they added one 1-inch silk/polymer composite dome tweeter. However, with so much power it generates, the consequence is the heat that it produces. But the Polk Audio RTI12 comes up with the solution. You don’t have to worry about overheating due to using it for too long. Polk Audio RTI12 has already prepared the best scenario with the neodymium magnets equipped with a low-viscosity ferrofluid cooler and a heat sink on the back of the magnet. The sound output all depends on how loudly you want to playback your source. To get the engaging speaker sound you need 100 Watts per channel. Furthermore, you can switch it to a 300W per channel setup, allowing the speaker to sound even louder. But it needs a stable and clean power supply. If you don’t have it, don’t mind trying switching to 300 Watts. Polk Audio RTI12 sounds better than an average audio speaker, but you need to have a better energy output. It will produce an easy, smooth, enjoyable, and clean sound. The great part is the possibility to settle noise for many different purposes. The loudness can be controlled with ease. So the performance is somehow fascinating but some little adjustment is needed for the powering. In the overall, Polk Audio RTI12 is a solid speaker product. While many speakers tend to overuse the modern style, it still retains originality and the real purpose of loud and bright speakers. Manufacturer : Polk Audio, Inc. 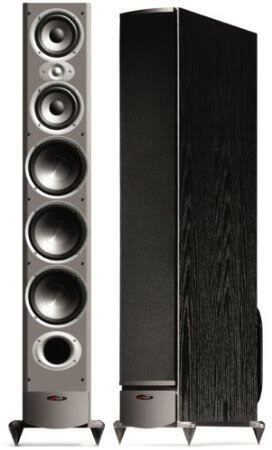 Check the best price for Polk Audio RTI12 here!